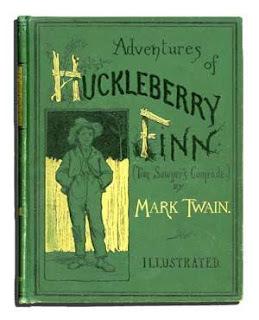 Bookride: Adventures of Huckleberry Finn. 1885. Have been away from my desk attending the sale of the books of a 1930s society person who seems to have known everybody including Lord Berners, Robert Byron and Paddy Leigh Fermor - I got some good things, which will appear in a pretentious catalogue come April. The auction was in Essex and they didn't take cheques. My remark that there must be a lot of villains in the area didn't go down too well. Credit cards or cash only. Today's book is by the great Twain. I recall that when he was hanging out with the cannibals he said something like 'I suppose you would like to eat me too' and was politely informed that the flesh of a heavy smoker and drinker was unpalatable to them. Mark Twain. ADVENTURES OF HUCKLEBERRY FINN. Charles Webster, New York, 1885. CLASSIC AMERICAN LITERATURE / JUVENILE FICTION. VALUE? The UK first is worth about a third of the US, but serious collectors like to have both. There is the story of the dealer who bought a copy privately lacking the front endpaper, when he remarked on this to the seller the chap said 'Yeah that had to go, some guy called Clemens wrote his name on it.' (An old chestnut-- sometimes it's Alice and 'some guy called Dodgson.') There are facsimiles of the first that occasionally turn up online with persons trying to sell them as the real thing; the first clue that something is wrong is that they are in unnaturally fine condition with bright white fore edges, don't be fooled.